I could not be more excited to share this post! For me there is nothing better than a gorgeous smelling warm candle lit in the Autumn months, to make you get in the cosy Autumn spirtit. For me Autumn has always had a hint of magic with the weather changing, the Christmas lights and sparkles and of course Halloween! To get us in the Halloween spirit, Yankee Candle have brought out their collection for the season. I couldn't wait to get my hands on these spooky treats! This year the collection consists of two scents, the much loved 'Candy Corn' and a more Autumnal spicy 'Witches Brew'. I just had to get my hands on the Candy Corn medium Jar! This has the most warm, sweet scent that is bound to make you feel warm and gooey inside! To me this has a kind of butterscotch hint to it, it's so addictive for anyone with a sweet tooth, perfect to get you in the Halloween spirit! This a little bit more pricey than a regular medium jar, but for £18.99 you're getting an extra special candle. 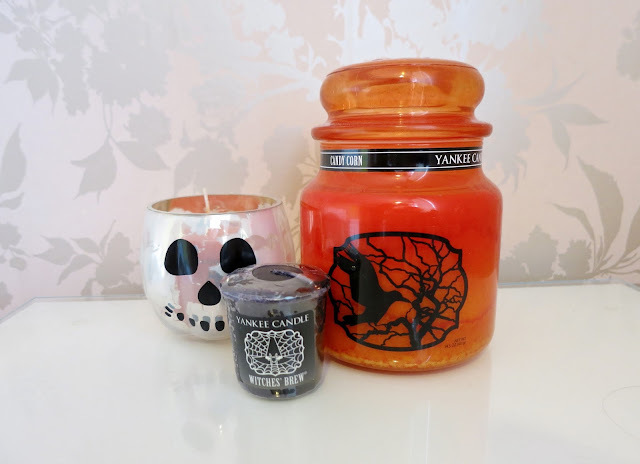 Not only does it have an indulgent scrumptious sweet scent, it also comes in a beautiful pumpkin orange jar, with a freaky Halloween design, making this the perfect decorative candle to add that extra hint of spookiness to your house this season. You can really enjoy this year after year to get in the Halloween spirit! I also ordered a 'Witches Brew' Sampler Votive as I had never tried this scent before but wanted to give it a ago. This has more of a spicy, herbal patchoulli scent to it, as a witches brew should! This will really get you in the magical Halloween spirit, whilst it feel your house with it's captivating aroma. I could see this being perfect for Halloween parties and ghoulish games, spoooookey eyy!! I couldn't help but pick up one of Yankee's freaky but fun votive holders too. I chose the Skull Votive Holder as it compliments the Candy Corns orange jar. This is the perfect Halloween accessory to get you in the spooky spirit. With Halloween only having a short period we can celebrate, this is great as you don't have to buy large candles you may not use, you can easily buy a couple of votive's that are very affordable (under £2!) and this will do the job perfectly! (I couldn't help but pick up a Candy Corn Votive too!). This is so cute and fun for this season, I can't wait to bring it out year after year. Yankee Candle also have many other decorative Halloween items that are definitely worth taking a look at, they really do know how to get you in the Halloween spirit! What will you pick up from Yankee Candle's Halloween 2015 Collection?